Can NBA Playoff TV Ratings Survive Without LeBron James? The NBA playoffs kick off this weekend, but there is one notable absence: LeBron James. For the first time since 2005, the league’s most recognizable player will be sitting at home when the postseason tips off, ending a disastrous first season with the Los Angeles Lakers. But how much will that impact the Nielsen ratings for ESPN/ABC and Turner? “Not having him in the playoffs? Obviously that is going to hurt,” Reggie Miller, an analyst for TNT, said during a press call earlier this week. But he adds that the Golden State Warriors going for a three-peat — and four in the past five years — is one of many still-compelling storylines this postseason. James’ move to the west coast had an impact during the regular season. Up until this season, James had played exclusively in the Eastern Conference, meaning that the majority of his games would kick off the national doubleheaders and thus give a boost to the later game. He also missed a month with a groin injury, and when he came back, the team struggled. TNT saw its ratings dip 12% this season for its 66 games, down to 1.5 million, and that included five Lakers games that did not feature James. This was also the first time in years that TNT’s opening night doubleheader did not feature a James-led team, which sank that night’s viewership this season by 42%, creating a hole it had to dig out of all season. ESPN fared better with its 101 games on ESPN and ABC, averaging 1.99 million viewers to draw even with last year. However, a look into the Nielsen ratings history shows that a “LeBron effect” is a real thing. From 2003 through 2005 — the three most recent seasons that did not feature LeBron James in the postseason (he was drafted in 2003) — the playoffs (not including the NBA Finals) averaged 3.6 million viewers, according to Nielsen. From 2006 through 2008, that average increased to 3.7 million viewers, a bump of 2.5%. The year-over-year lift between 2005 and 2006 was 10%. Last year’s postseason averaged 4.96 million viewers. 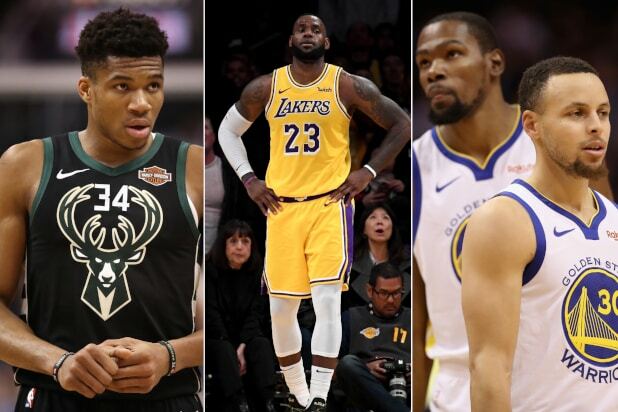 James’ absence from the Eastern conference — which his teams have won each of the past eight seasons — creates room for other stars, such as the Milwaukee Bucks’ Giannis Antetokounmpo and Philadelphia 76ers’ Joel Embiid and Ben Simmons. ESPN’s Burke Magnus, the network’s executive vice president, programming and scheduling, noted that the Bucks and Toronto Raptors “performed above viewership expectations” during the regular season. “Maybe this is a chance for some of these fringe stars — guys who think they want to be superstars — maybe this is a chance for them to grab a little bit of that spotlight,” Miller added. Whether ESPN/ABC and Turner will grab satisfactory ratings without the draw of LeBron James is also in the “maybe” column for the time being.